There are certain things in this world that just blow you away at first glance. Some are gifts of nature, some are man-made. I had not been blown away by any of the recent devices that have arrived in the market. Samsung's new tablet range did not excite me either, but when I looked at the screen of Tab S for the first time, I was amazed. The hugely impressive Super AMOLED screen has the quality to give the Apple iPad mini's Retina display some serious competition. While the Galaxy Tab S 8.4 is an evolution of the Tab Pro 8.4 launched earlier this year, it's a much-needed one. The Tab Pro suffered from the ill-advised faux leather and fake stitching effect Samsung introduced in 2013 with the Note 3, and it didn't sit comfortably with the Tab Pro's premium price. In comparison, the Tab S 8.4 is a huge improvement, though it still falls short of the metal, unibody design of the iPad mini 2. 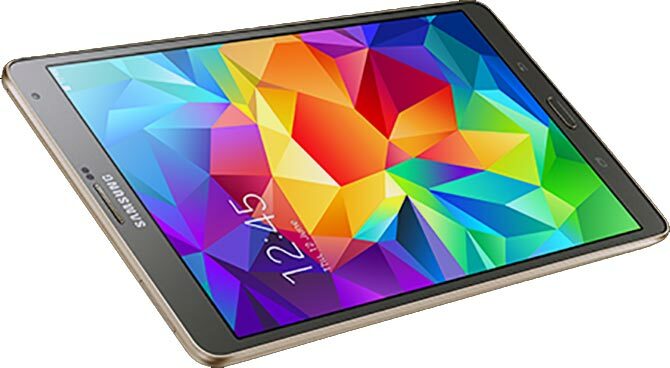 The Tab S 8.4, along with its larger sibling the Galaxy Tab S 10.5, has a similar dimpled, soft-touch finish as the Galaxy S5. It has a pleasant texture to handle, and the slim, curved edges sit comfortably in the hands. The Tab S 8.4 feels solid, which is impressive considering that it weighs just 294 g, a good 30g or so less than the iPad mini, and is a measly 6.6mm thick. How do I describe the Galaxy Tab S 8.4's screen? Bright, vivid, sharp, clear, deep. outstanding. They all fit. Being Super AMOLED, its contrast and black level is in a different league to any LCD-screen tablet out there. Blacks look truly and magnificently black. Videos look deep and detailed; photos are rich with colour and impact. Combine this with the super-sharp 2,560 x 1,600 resolution, which on a 8.4-inch amounts to 353 pixels per inch, and you have a truly stunning screen. The 8.4-inch size is an ideal one, too. Like the iPad mini, the Tab S 8.4 is easy to hold in one hand and is the perfect size for reading on the move. This is a great commuter tablet. Samsung employs stereo speakers on the Tab S 8.4 and they're situated just off centre at each end of the tablet. This lets them give a moderately convincing stereo performance. 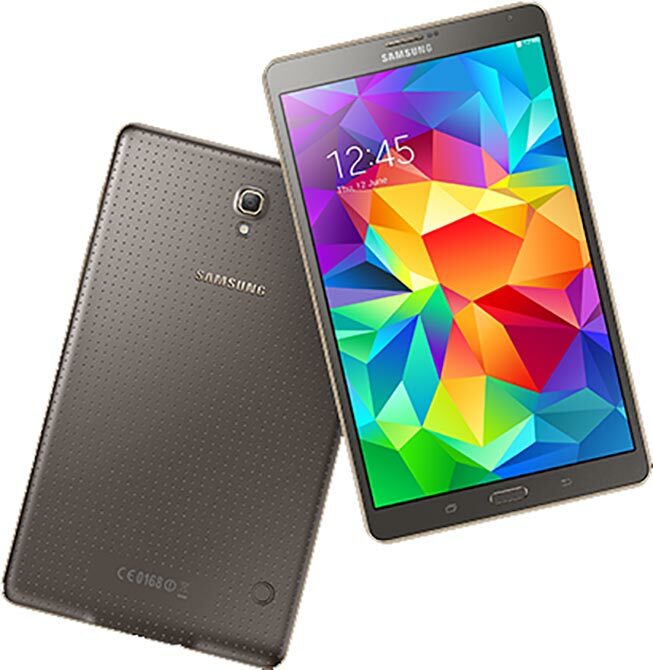 The Galaxy Tab S 8.4 runs Android 4.4 with Samsung's cheery and colourful TouchWiz UI on top. On tablets, the main features include Multi-Window and the Magazine UI. Multi-Window is quite useful as it lets you run apps side-by-side and copy information between them. The Galaxy Tab S 8.4 is, generally speaking, very smooth and slick. The processor behind this is Samsung's Exynos 5 Octa (5420), which is an eight-core chip with four ARM Cortex A15 CPUs clocked at 1.9GHz, and four lower-power ARM A7 cores at 1.3GHz. 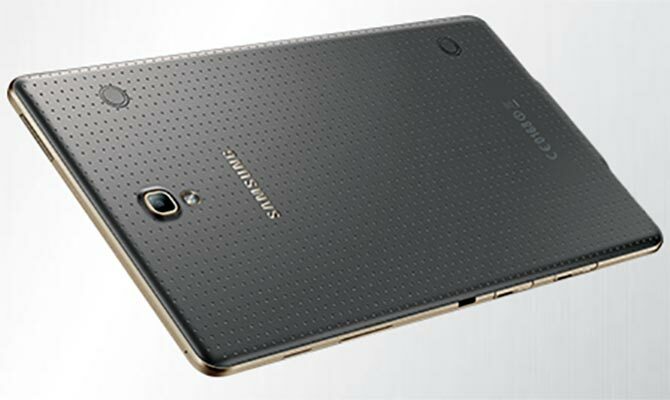 The Galaxy Tab S 8.4 has a 4,900mAh battery - a slight improvement on the 4,800mAh battery in the Tab Pro 8.4. It's good for 10 hours of standard definition video, or nine hours of streamed HD videos, both at 50 to 60 per cent brightness. This is a very good result, and mixed use should take you comfortably through 12 hours or so. 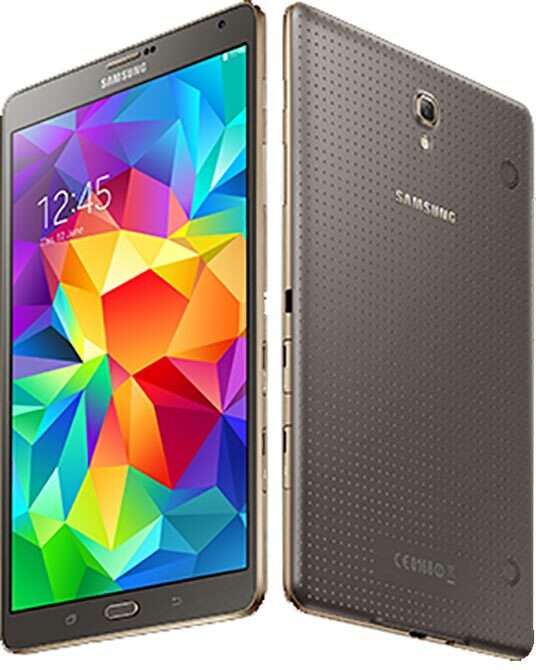 The Tab S 8.4 has an 8MP camera on the back and a 2.1MP camera on the front, and the rear camera has an LED flash. That final feature sets the 8.4 apart from most tablets, and its size means it's slightly more practical to use the camera than larger tablets. If you're choosing between this and an iPad mini with Retina display (cellular model) then we'd still recommend the iPad. While the Samsung Galaxy Tab S 8.4's screen gives it an edge, the iPad's screen is still very good and it comfortably wins for its better design, slicker software and superior tablet apps. But if you have no interest in having a bite of Apple, then at Rs 37,500, the Galaxy Tab S 8.4 is one of the best Android tablets you can buy.